Now's the Time to Register for our 50th Reunion! The snow is gone, the trees are in bloom, and the grounds crews are putting the finishing touches on the Yard. Now is the time to register for our 50th Reunion. This is the BIG party, don't miss it. Over three hundred and seventy classmates have already registered. We are expecting to have close to 500 classmates in attendance. If you want housing in the Harvard houses, you must register by May 15th. 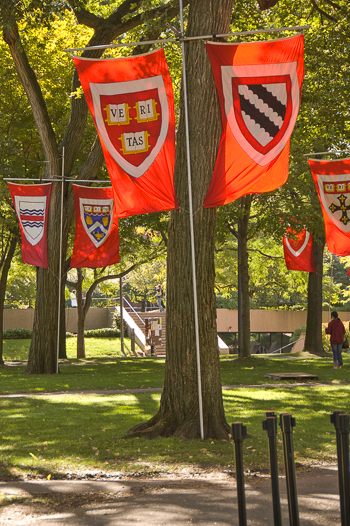 You can register online at the Harvard Alumni Association's site. You can see a list of who's coming to the reunion on the class Website (registration required). There's lots of information online at hr65.org. You can see the Reunion Schedule and also brief descriptions of all the main reunion events. Do you have a vague memory of something interesting in one of the Reunion emails? Most of them have Web versions, which you can access online. We will be having a golf outing on Monday, May 25 at the Robert T. Lynch Municipal Golf Course, Putterham Meadows, Brookline. Free transportation will be provided to and from the golf course. We will leave Quincy House at 6:45 AM and return to Memorial Hall at 1:00 PM in time for our symposium. Tee-off time is 7:30 AM. The outing will feature a very informal and friendly competition with the emphasis on fun. Rental clubs are available. The cost is $63.00 per person including a cart. Walkers are $42.00, club rentals $30.00 and pull-cart rental $8.00. As of now the participants are: Anthony Barash and friend Teri Hanson, Dina Rome Spechlar and her husband Martin, James Campen (former Captain of the Harvard golf team), John Harmon, Kent and Charlotte Brittan, Patricia Jones Adams, Paul and Becky Hilstad, Pit Marshall, Stanley Yastrzemski, David Mersky and Gene Skowronski. We hope others will join in! We think this will be a fun event and a great way to start off the reunion with a chance for some fresh air, exercise and the enjoyment of a late spring day in New England. If you would like to participate, please contact Gene Skowronski at eugene.a.skowronski@snet.net or by telephone at 203-734-3315 (w) or 203-305-5754 (cell) or 203-734-3671 (home). The Harvard Art Museums will be open on Sunday from 9:00am - 5:00pm and admission is free as long as your name is on the list of Reunion registrants. The Crimson Key is offering a number of tours on Sunday and Monday. There will be an Open Mic session Sunday Evening. A Football affinity event will take place on Wednesday, May 27th 5:00pm - 6:00pm in the Harvard Athletics Gazebo. We will post more information on the Class Website soon. This promises to be an outstanding reunion. Many, many people have worked hard to bring all these events together. We hope to see you there. Thanks to Maria Tymoczko's efforts a second edition of Born into a World at War will soon be available. As you know, this is a fine portrait of what the world was going through when we were born, told through the personal stories of our classmates and their families. I am planning to give copies to all of my children and grandchildren. Someday they will value the insight into the past when their parents or grandparents were born. Once the book is published, you will be able to order copies through the University of Massachusetts Press at 800-537-5487 or at www.umass.edu/umpress.